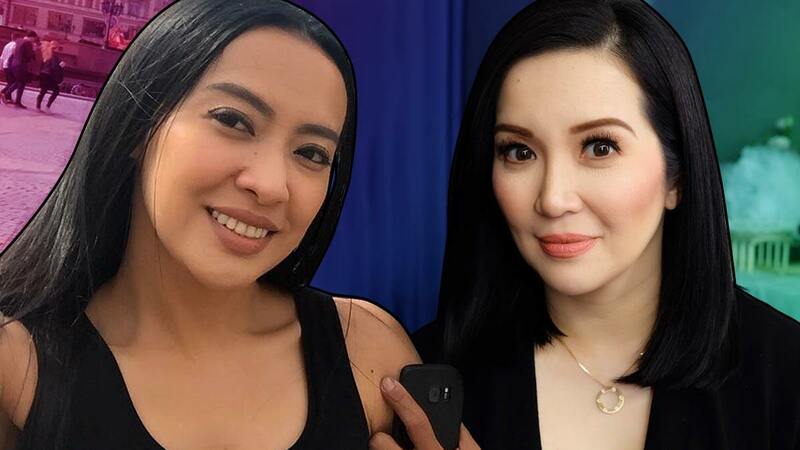 In case you missed it, Kris Aquino and Presidential Communications Operations Office (PCOO) Assistant Secretary Mocha Uson are caught in an online war that all started with a kiss. Let's take a look back at the series of events that led to Kris saying, "Gusto mo ng kaaway? Ako. I'm ready." President Rodrigo Duterte kissed a Pinay overseas worker on the lips during a gathering of the Filipino community in Seoul, South Korea. Duterte went to South Korea for a three-day official visit, which includes talks with South Korean President Moon Jae-In for "greater partnership in defense and security, trade and investment, and political cooperation." ABS-CBN reported: "Duterte called the woman from among the crowd to receive a copy of a book titled Altar of Secrets which exposed supposed corruption in the Catholic Church." You can watch in the video below that he gave the book in exchange for a kiss. The president said, "Huwag ninyong dibdibin yun. Ano lang yun... pampasaya ng mga tao. Gimmick." The Pinay involved released a statement saying, "Yung kiss? Twist lang yun. Pampakilig sa mga audience. Walang ibig sabihin yun, promise. Walang ibig sabihin." "The kiss" drew mixed reactions from everyone—celebs, personalities, politicians, and the academe. This tweet from Emily Rauhala of the Washington Post gives a peek into the public backlash that followed. PCOO Assistant Secretary Mocha Uson shared a roughly spliced video including footage of former President Corazon Aquino's state funeral, screencaps of various news articles and quotes from Uson herself, and yes, Taylor Swift and Care Bears. She also included footage of Ninoy Aquino being kissed by two women as he was seated in a plane, edited with the controversial footage of Duterte kissing the OFW in South Korea. She wrote in the video text, "Masagwa daw ito??? Pero eto hindi???" Kris, the daughter of the late Cory Aquino and Ninoy Aquino, clapped back at Uson on social media, saying, "Kung may gusto kang punching bag, please ako na lang. Kasi buhay ako, kaya kitang sagutin. At hindi kita uurungan." Along with her tweets, Kris posted a 17-minute long video via her Facebook page. She said, "This is really not about me. This is about the legacy of two people I really love. This is about Ninoy Aquino and Cory Aquino. And this is about a woman who never knew them na hindi tumitigil na bastusin ang pangalan ng mga magulang ko. Tama na." Kris also said, "Sobra ka na e. Ang mga sinaktan mo, mahal na mahal ko. Ganito na lang ha? Diretsahan na—babae sa babae. Gusto mo ng kaaway? Ako. I'm ready. Anytime, anywhere. Harapan. Gusto mo mag-debate? Keri. Gusto mo gawin yung eksena sa movie [na Four Sisters And A Wedding]? You wanna do that scene with me? You want na ako ikaw at ikaw si Angel [Locsin]? Gawin natin! Para matigil ka na lang. Because what you are doing to my parents, they do not deserve, okay?" To shed light on "The kiss," read Esquire Philippines' "Veteran Journalist Sheds Light on The Video of Ninoy Aquino Receiving Kisses." PEP.ph reported that Special Assistant (SA) to the President Bong Go apologized to Kris on Mocha's behalf via a text message that stated, "We are sorry for the incident." Go also said that Mocha will apologize to Kris. Kris replied on Instagram: "I have known [and] liked him for eight years. In this instance I am Ninoy Aquino’s daughter—he believed in the power of true [and] honest communication...SA Bong, thank you for your reply. Thank you for taking my feelings as a daughter into consideration and showing me EMPATHY. Mocha replied to Kris, but not to apologize. She said in her video, "Ms. Aquino, this is not about you." Kris fired back in another video, where she wore a black tee with the word "Power" written across the chest: "When it is about my mother and when it is about my father, it will always be about me. You say it is not about me. It will always be about me, dahil anak ako." Kris continued the conversation on Instagram. "Pero ito ang pananaw ko—the most powerful man, President Duterte affirmed my pain. When all his supporters have called me the most hateful names—the man who doesn’t say SORRY—inutusan ang kanyang pinaka pinagkakatiwalaan na mag-relay ng SINCERE apology sa'kin." She ended the post with, "Pasensya na kung #BRAT ang tingin ninyo pero this was a #WIN for the memory of the two people I love—unfortunately for the HATERS I am here to stay."